The next meeting will be held in Halifax, NS on November 27-29, 2018. The meeting will provide an update on CISMaRT activities, report on major new initiatives and focus on project developments. Further details will be sent to CISMaRT members by the end of July. The update of current CISMaRT programs will include a progress report on two pilot projects first reported on in the December 2017 newsletter. The first pilot project concerns operational capabilities of low- and non-ice class vessels in ice and the second focuses on developing best practices to ensure CFD analyses are performed proficiently for problems important to the marine industry. While CISMaRT has been successful in obtaining funding to support its interim activities, further efforts are being made to seek additional funding for longer-term operations, particularly to support major new initiatives. Progress made on this front will also be discussed in the November meeting. CISMaRT continues to seek ideas for projects, and we are happy to report that a major new initiative is being developed in collaboration with Transport Canada. The initiative concerns the technology for mitigating ship noise and associated issues. 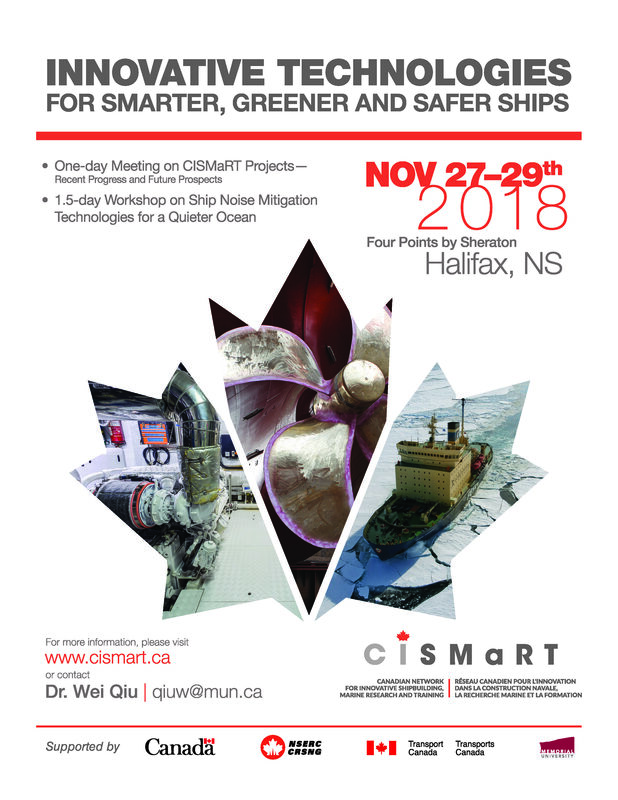 CISMaRT is working with Transport Canada to host a workshop on the subject as part of the November meeting. A short course is being planned in conjunction with the workshop that will provide an introduction to underwater noise caused by ships. Ship time has been made available to CISMaRT to conduct engineering research. More details will be available at the November meeting and we will be looking for insight and ideas from participants. If you have any suggestions to improve the newly launched website (www.cismart.ca), please contact qiuw@mun.ca. As part of our effort to secure funding from various sources to support R&D activities, CISMaRT submitted a letter of intent (LOI) to Networks of Centres of Excellence (NCE) on November 2017, requesting $13M over five years to support collaborative research and development on smarter, greener and safer technologies. Note that an additional $20M cash and in-kind contribution has been provisionally committed to this initiative. We will know if the LOI is successful in February 2018. And, we continue to seek core funding from other sources. Pilot project #1: DRDC, Vard Marine, ABS, and Memorial University have committed cash and in-kind contributions to investigate Operational Capabilities of Low and Non-Ice Class Vessels in Ice. A proposal has been submitted to NSERC applying for matching funds. The total value of this four-year collaborative project is $1.1M. It is anticipated the project will start in Spring 2018. Pilot project #2: The project is to develop the best computational fluid dynamics (CFD) modeling practices for problems important to the marine industry with an objective to improve the design and operation of ships and marine structures. The project is under discussion and involves industry, government and academic partners. A start date in early 2018 is anticipated. Please contact qiuw@mun.ca for more information, and if you are interested in participating in the project. 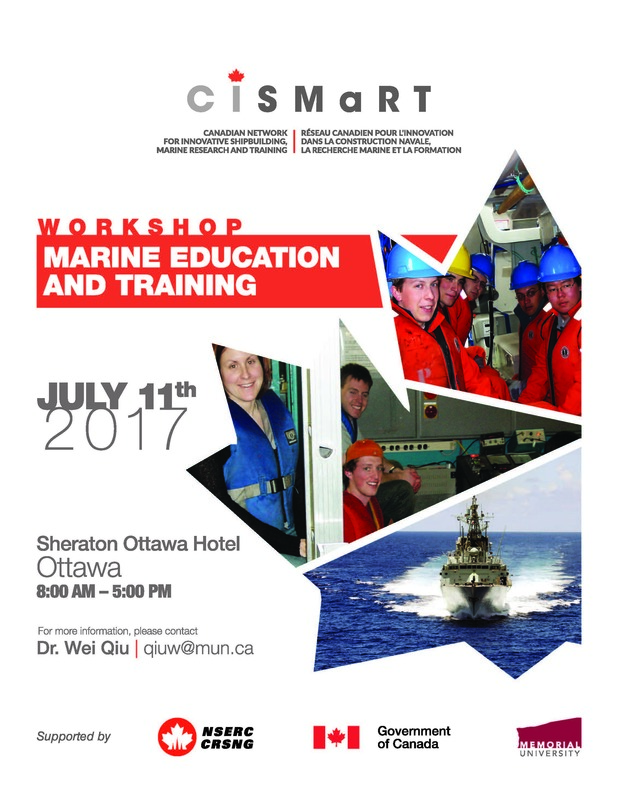 The draft report summarizing the outcomes of the Ottawa Workshop on Marine Education and Training is now available here for suggestions and comments.